Immusoft is developing a cutting edge approach to sustained delivery of protein therapeutics using a patient’s own cells. The approach is called Immune System Programming (ISP™). ISP entails collecting a type of the patient’s immune cells, called B cells. In response to immune stimulation, B cells can turn into a biofactory state known as a plasma cell. Plasma cells manufacture and secrete thousands of antibodies per second. We harness this biofactory capability of the plasma cell by programming B cells to produce a given protein therapeutics. Once we have programmed the B cells we expand the number of them many times and differentiate them into plasma cells (or, stated simply, coax them into the biofactory state) that produce massive amounts of our therapeutic protein. 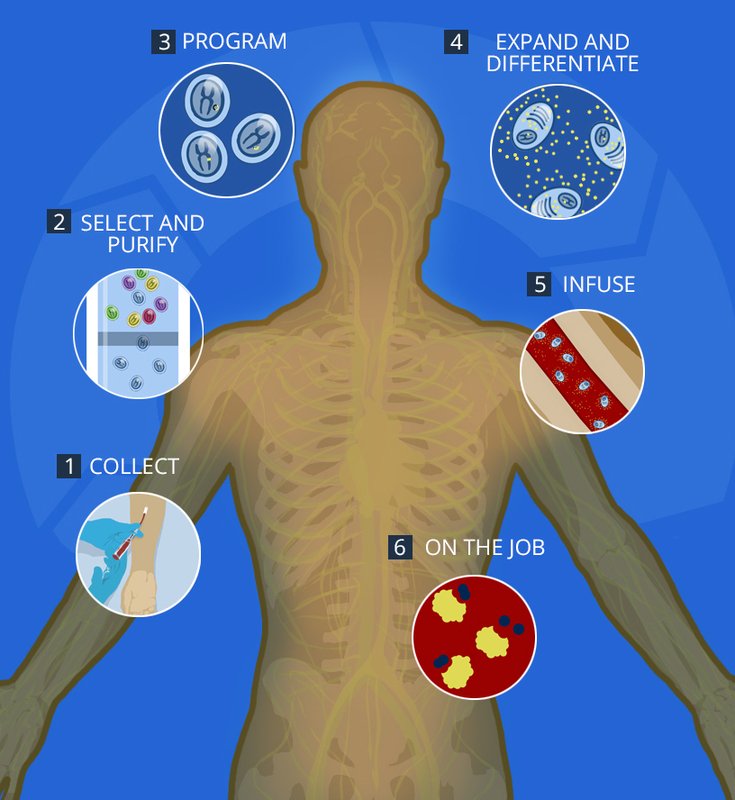 Thereafter we infuse the ISP™ programmed cells back into the same patient, where they take up residence and produce therapeutic proteins for extended periods of time. This chart provides an overview of our ground breaking technology. Click below for a fuller explanation. SEATTLE–(BUSINESS WIRE)–Immusoft Corporation, a Seattle-Wash.-based cell therapy company, announced today that the U.S. Food and Drug Administration (FDA) has granted it Rare Pediatric Disease Designation (RPDD) for Iduronicrin genleukocel-T, Immusoft’s Sleeping Beauty transposon-engineered autologous plasmablasts for the expression and delivery of alpha-L-iduronidase (IDUA) to treat Mucopolysaccharidosis type I (MPS I). 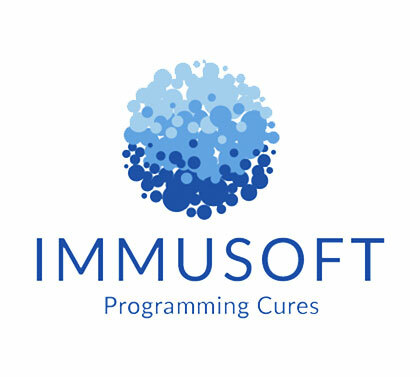 SEATTLE–(BUSINESS WIRE)–Immusoft Corporation, a Seattle, Wash.-based cell therapy company, announced today that it has received a Phase II Small Business Innovation Research grant (SBIR) from the National Institute of General Medical Sciences, part of the National Institutes of Health (NIH). 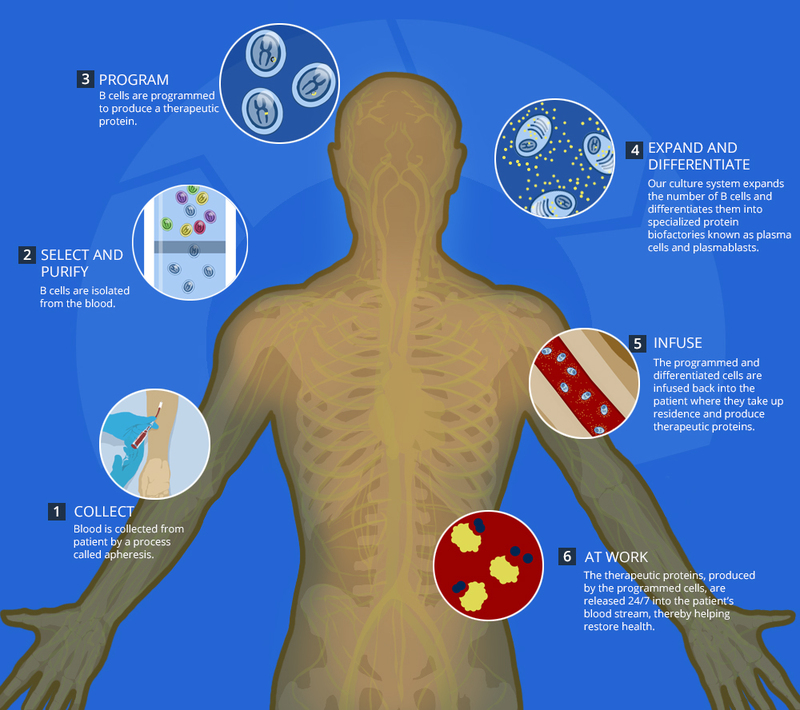 The grant, in the amount of just over $3.5 million, will enable Immusoft to further advance its modified B cell approach to treating disease.